In front of the Capitol several speakers said they have had to go to bed hungry so their children would have food to eat as each paycheck runs out at 2 week intervals. Another pointed out that corporations have paid higher wages before. The minimum wage paid when such laws were first enacted was equivalent to about $15 an hour today. Instead it is CEO and maangement pay that has gone up. 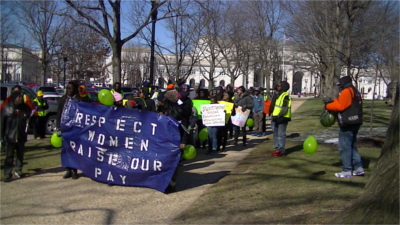 DC is getting a minumum wage hike, but only to $11.50 an hour over several years. This was passed in response to downward pressure on wages expected from Wal-Mart's entry into DC retail. There is a common myth that minumum wage workers are teenagers, but one of the speakers cited an average age for minimum wage employees in fast food in the 30's.